A monumental Mid-Century landmark, the Palm Springs Aerial Tramway continues to play an important part in the Coachella Valley’s tourism industry as major attraction and a visible beacon from the mountain signaling seasonal events to residents below. The official Palm Springs Aerial Tramway’s Annual Christmas Tree Lighting Ceremony will be on Sunday, December 4. Actor and comedian Ronnie Schell will be the Celebrity Tree Lighter and festivities begin at the Mountain Station at 5:30pm with the Palm Springs High School Choir singing a selection of holiday songs. When the tree is lit, it can be seen throughout the Coachella Valley. Both the Valley Station and Mountain Station will be festively decorated. For Tram admission tickets and more information, visit www.pstramway.com. One of Palm Springs most famous attractions, Tramway is a compelling demonstration of form and function, proving Modernism’s relevance today. Modernism is not only beautiful and dramatic, it is highly functional. “Form follows function” is the mantra underlying the Mid-Century aesthetic. Both of the Tramway stations were built by two of Modernism’s most notable architects: Swiss-born Albert Frey designed the Tramway Valley station, constructed between 1949 and 1963; and E. Stewart Williams designed the Mountain Station, built in 1961. Frey also designed the iconic “flying wedge” canopy of the Tramway Gas Station at the foot of the entrance to the tramway, now locale of the Palm Springs Visitor Center. Back in 1935, the idea of a cable car reaching from the hot desert floor to the cool pines some 8500 feet above was not only a daring vision, but visionary Francis Crocker, an electrical engineer, was deemed a bit foolish. His dream was dubbed “Crocker’s Folly” by the local newspaper. It took three decades, two wars, surmounting funding problems and resistance from county and local government before “Crocker’s folly” became a reality. Work on the tram began in 1949 and was formally dedicated in September,1963 with state, local dignitaries, and Crocker himself in attendance. Frey’s Valley Station forms a bridge that allows water runoff from the mountain to pass underneath, and through large steel framed windows, offers close up views of the mountain and the steep cable that ascends from an elevation of 2,643 feet to the Mountain Station, 8,516-feet above at Mt San Jacinto State Park and Wilderness. 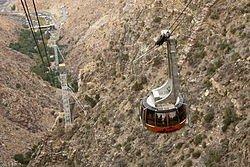 The Palm Springs Tram has the steepest vertical cable rise in the U.S. and the second steepest in the world. From the 360-degree rotating cable cars, a thrilling vertical ascent gives you views of the Chino Canyon and the San Jacinto Mountains, slowly turning to show the vast Palm Springs area desert splayed out below. Passengers move from one ecological zone to another: The heated desert floor through mountain canyons and chimneys to an arctic-alpine forest with giant Ponderosa pines. At the Mountain Station, you step from the tram car into the large, three-story facility which has a cocktail lounge, dining facilities, gift shop and dramatic observation decks. 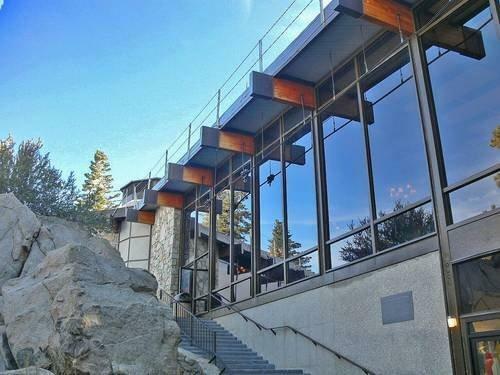 E. Stewart Williams’ glass, steel and concrete building is anchored to the mountain on one side while its north edge juts over the steep canyon precipice below. The Tramway project seems to summarize the philosophy and daring of the Modernism movement: That technology (and optimism) can overcome any challenge. The Tramway was one of the first projects in the world to use helicopters in construction. It was labeled the “eighth wonder of the world” because of their ingenious use in erecting four of the five supporting towers. Helicopters flew some 23,000 missions during the 26 months of construction, hauling men and materials to erect the towers and the 35,000 sq. ft. Mountain Station. The first tower at the Valley Station is the only one that can be reached by road. The Tramway was designated an historical civil engineering landmark. 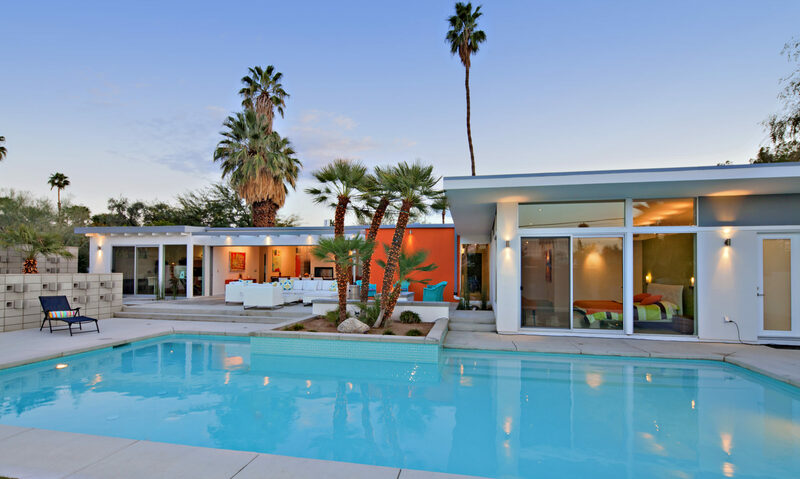 After your Palm Springs Aerial Tramway adventure, satisfy your passion for Modernism and take a tour of Mid Century Modern homes and estates for sale in the Palm Springs area. Many are located in historic districts and significant neighborhoods, some even in the foothills of the majestic San Jacinto Mountain.